Our classic original large format A1 flip chart is printed full colour onto 90gsm bright white paper stock. This is an affordable solution for short term use at corporate meetings and presentations. If you need something more bullet proof, then laminated flip charts are the alternative. 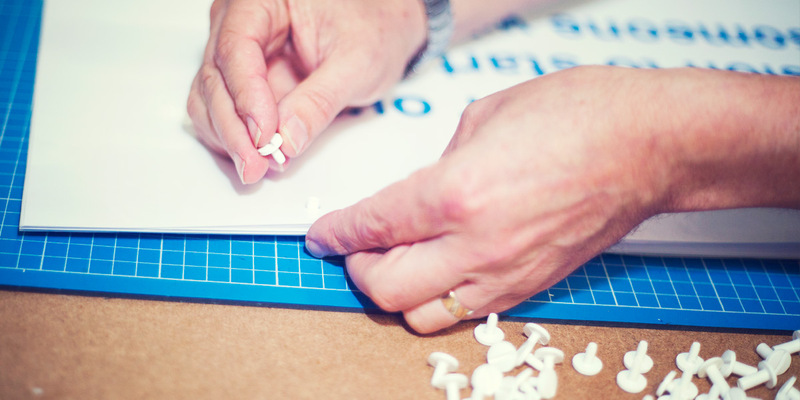 This is our latest popular finishing service in which we can glue the short end of the flip chart pad with a special rubberised glue that allows you to have no clips or bolts in the pad so you can simply remove each sheet as and when needed. This is really useful for tracking sheets or daily checklist sheets or in facilities where there can be no plastic or metal (i.e the food industry). We can also do larger pad sizes with this method, allowing you to have 30-100 sheets per pad if required. To get the most out of your flipcharts, we highly recommend our laminate encapsulation service. Not only does this give your flipcharts longevity, it also allows you to write directly onto the sheets using whiteboard markers. Useful for repeat events or travelling, or if you simply want to reuse your pads time and again. A popular choice for many customers is our traditional perforated flipcharts. We can perforate the top of the flipchart pad for an easier method of tearing off a sheet from the flipchart easel. This is particulary useful for writing notes onto the pad and then removing it for use in a room/group. We realise that not everyone has the same requirements or ones that fit into a specific box, so for everything else we offer our bespoke service. We aim to be able to assist you in your project whatever it may be. Whether you require a custom mounting solution, alternate or extra mounting holes, A0, A1, A2 size prints or paper stock options like Glossy, Matte or Textured, we can work with you on the best solutions. Bigflip is the original and only providers of quality, fully finished flip charts in the UK.